Lulu hasn’t been in 1920s Hollywood long, but she knows there are schemers who’ll do anything to get a role with the big movie studios – absolutely anything! After her run-in with gangsters, hidden identities, and murderous gossip in her first mystery as Girl About Town (my no-spoilers review here), the New York native has her eyes wide open and her exit route planned during this raucous extended audition turned deadly. Glitz, glamour, and gore – ready for your close-up? Book info: Murder Among the Stars (Lulu Kelly mysteries, book 2) / Adam Shankman and Laura L. Sullivan. Atheneum Books, 2017. 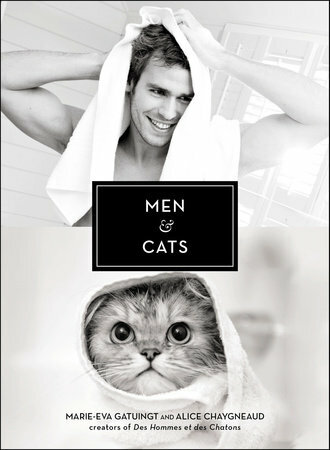 [Adam’s bio] [Laura’s Facebook] [publisher site] Review copy and cover image courtesy of the publisher. My book talk: Playing footsies with a corpse wasn’t what Lulu had expected at this elegant dinner, but the young actress finds even more bizarre things during the weekend-long audition for a movie contract, as she’s drawn into another mystery in 1920s Hollywood. Imagine being wealthy enough to build a California castle, to own a menagerie with a real lion, to flaunt your mistress in Society, to give expensive gifts to every guest without blinking an eyelash! For newspaper and movie magnate William Randolph Hearst, this extravagant house-party is just a simple favor for writer Anita Loos, until actresses start being murdered. For new-to-Hollywood Lulu Kelly, it’s her chance for a starring role, if the 17 year old can outlast the other twenty starlets trying to win over WR and Marion. For Lulu’s boyfriend Freddie the private eye, this huge party at the remote estate means too many suspects and too many motives for blackmail and murder. Why is WR’s 10 year old niece Patricia so interested in crimes and murders? How can anyone believe that the first suspect nabbed for the first murder did it? Who invited mobster Sal to this party and does anyone know his connection to Lulu? Dive into the intrigue and gossip of movie legends in this second Lulu Kelly mystery, as silver screen secrets become oh so deadly. After reading The Metamorphosis while longing for a guy, stressed-out Gretchen gets her wish to “be a fly on the wall” and hear what people are saying about her = she’s now a fly trapped in the boys’ locker room! Take a peek at Gretchen’s life at Ma-Ha in this excerpt (free, courtesy of the author), then take the scenic route to your local library or favorite independent bookstore to see what she sees as a Fly On the Wall. Would you want to hear what everyone says about you? 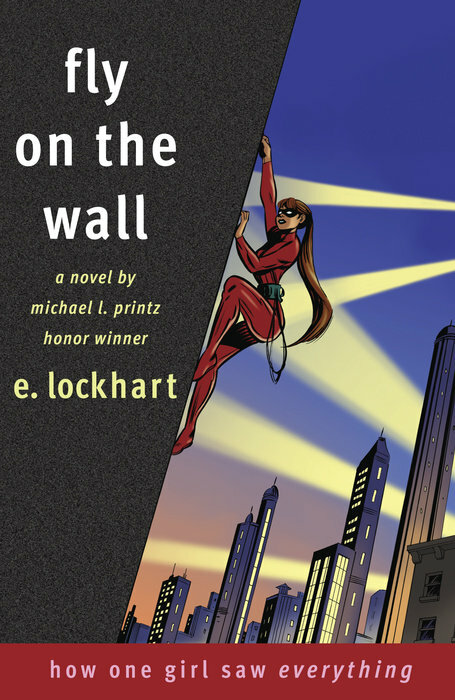 Book info: Fly On the Wall / e. lockhart. Delacorte Press, 2007. [author site] [publisher site] [60-second book recap video] Review copy and cover image courtesy of the publisher. My book talk: Feeling like a nonentity in her New York City arts high school, Gretchen agonizes over her comic-drawing skills (teacher is unimpressed), her mom’s demands during the divorce (throw away how much before we move? no, thank you), her best friend (getting distant), and her crush (he will never notice her, will he?) until she amazingly turns into a fly who can see and hear everything, especially what the boys are saying (and not wearing) in their locker room! Friendship, love, identity, dumplings, and Title IX protests – all in one fly-tastic story. Higgs is content to follow the detailed plan for his future – early admission to Harvard, becoming a dentist like his father and grandfather – but everything goes sour with that random question just before graduation. Then he meets free-spirit Monarch and things take a different path utterly and entirely. How do you bounce back when a slip-up derails your plans? 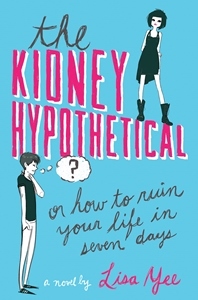 Book info: The Kidney Hypothetical, or How to Ruin Your Life in Seven Days / Lisa Yee. Arthur A. Levine Books, 2015. [author site] [publisher site] [book trailer] Review copy and cover image courtesy of the publisher. My book talk: For Higgs, his future as a Harvard-educated dentist like his dad (and as planned for his deceased older brother) is all set, until his answer to a hypothetical question starts a chain reaction of awful at his California high school and brings wild and wonderful Monarch into his life just before graduation. Magic, malice, bodies switched, perhaps love? 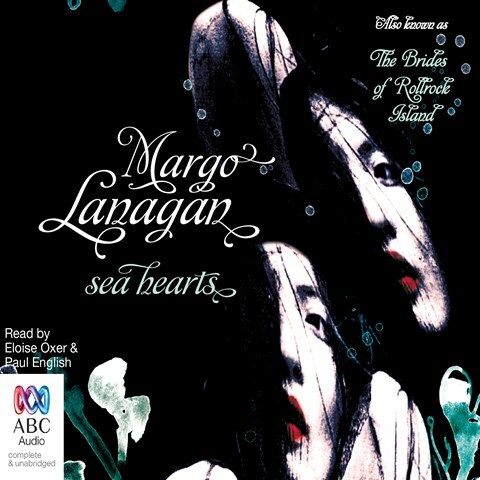 Time to download this week’s free audiobooks from SYNC so you can read with your ears! Click on the title to go directly to its AudioSYNC download site, enter your name and email, and follow the instructions to get these magical, dangerous tales for yourself. 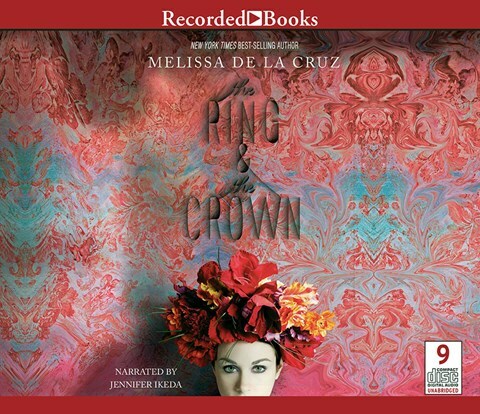 Published by Recorded Books, Inc.
To escape an arranged marriage in the Franco-British Empire, the princess will give her identity to Morgan whose magical talents almost equal those of the Empress herself. But can the deception keep both girls safe? As the sea witch discovers how to turn a seal into a woman, the magical consequences may affect everyone on her remote island. Is creating the perfect wife for a sailor worth the risk? Have you ever wished that you were someone else? As they did in Pick Up Game (my review here), the editors asked one YA author to write the first story on the collection’s theme of initiation. Then eight other writers took strands from “Down Below” as they introduced teens whose lives were impacted by Kevin’s life and death, each tale one of a pivotal line crossed, a change that can’t be undone. Like a kaleidoscope’s image changes when it’s passed from one viewer to the next, these nine interlocked stories show many different images of the 19-year-old New Yorker, darkness with glints of hope, questions of racial identity, parental affection, and the bonds of friendship. Just published today – come over to Kevin’s neighborhood, meet his sister, his running buddies, the funeral home cosmetologist, the dead ends and new beginnings. 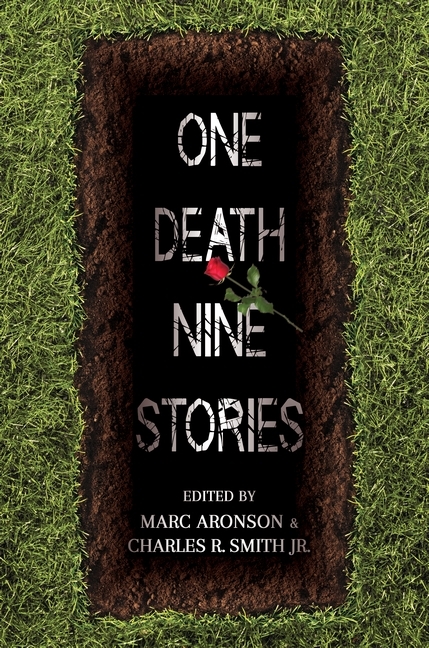 Book info: One Death, Nine Stories / edited by Marc Aronson & Charles R. Smith. Candlewick Press, 2014. [Marc Aronson’s website] [Charles R. Smith Jr.’s website] [publisher site] Review copy and cover image courtesy of the publisher. My book talk: Initiations in teen life – joyous, bitter, tragic – weave together this short story collection of the many firsts experienced after Kevin’s death by teens who knew him and some who’d never even met the 19 year old. The anthology begins as Rita Garcia-Williams takes us to a teen’s first day of work at his uncle’s funeral home as drifting-along Morris suddenly realizes that he went to high school with the guy in that body bag. Mick first meets Kevin as an altar boy in “Initiation” by Ellen Hopkins, but won’t play along to “The Next Next Level” of dangerous deeds in Torrey Maldanado’s story. Kevin’s track teammate “Running Man” must outrace a bullet, tells Charles R. Smith, while Jackson starts football “Two-a-Days” down in Chris Barton’s Texas wondering about this Kevin guy whose death caused so many messages online. “Just Once” Candy would have liked Kevin to give his affection without the bleak insults, chronicles A.S. King, while Kevin’s little sister reclaims his personal effects and finds herself saying “I Have a Gun” in Will Weaver’s tale. Nadira’s “Making Up the Dead” (by Nora Raleigh Baskin) and making something of herself, while the college “Connections” described by Marina Budhos aren’t enough to keep Kevin in this world.